Complete your living room or family room with this comfy queen sleeper sofa. 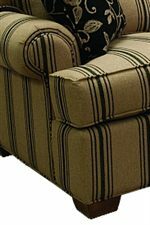 A plump attached seat back and plush t-cushion seats provide a cozy seat, with rolled arms for added comfort and support. The tapered block feet create a modern look to this sleeper sofa, for a stylish room design. A queen size premium innerspring mattress offers additional sleeping space for guests. Choose from a variety of fabrics to find the perfect match for your decor. The 6200 Queen Sleeper with Attached Backs and Block Feet by Lancer at Belpre Furniture in the Belpre and Parkersburg, Mid Ohio Valley area area. Product availability may vary. Contact us for the most current availability on this product. Update your traditional seating space with the casual style of the 6200 series. This collection features plump attached back cushions, plush t-cushion seats and soft rolled arms for a comfortable seating arrangement for your living room or family room. Tapered block feet add a modern design. Available in a variety of fabric choices, find a look that complements your decor with the 6200 series. Coordinating items also available include a chair, loveseat and ottoman. The 6200 series is available with a skirted base in the 6220 series, track arms in the 6400 series, and also available with loose backs with a skirt in the 6240 series. The 6200 collection is a great option if you are looking for Casual furniture in the Belpre and Parkersburg, Mid Ohio Valley area area. Browse other items in the 6200 collection from Belpre Furniture in the Belpre and Parkersburg, Mid Ohio Valley area area.